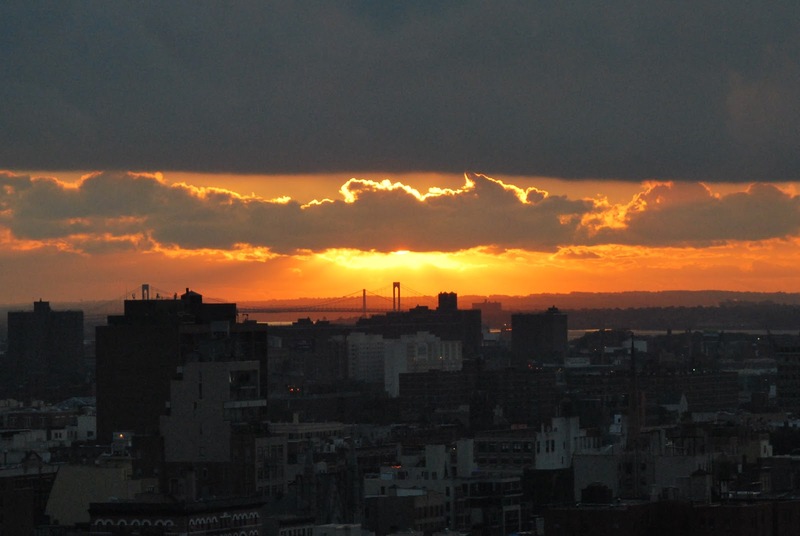 Dawn over New York City. The name itself invokes an image and a time that is different for everyone. A city that draws writers and artists into its Big Apple core, New York City, has and will remain a muse that is more often than not portrayed as a love letter to the city. When American writers were gathering on the Left Bank of the Seine in Paris during the 1920s one of Europe's most accomplished writers, Federico García Lorca, headed in the opposite direction to New York City. Arriving in June, 1929 to work on his English, Lorca instead spent his seven months stay shocked by New York's bigotry and crass consumerism. A witness to his times, he saw the construction of city highrises that would touch the sky and the stock market crash the economy of America. He put his observations and thoughts to paper in what would become A Poet In New York. The thin volume of 37 poems is definitely not a love letter to New York and had it been written in the 1970s would probably be considered a bible of the burgeoning punk music scene in the city. The manuscript of A Poet In New York was delivered in 1936 to his editor in Madrid with a note stating that he would be back the following day. He never did return. The Spanish Civil War broke out soon after and Lorca returned to his family home in Granada where he was brutally murdered early in the conflict. His remains have never been discovered. Published posthumously in 1940, A Poet In New York has been discussed and dissected in the city he called a "maddening boisterous Babel" on its 50th anniversary in 1990 and as recently as an exhibition last year at the New York Public Library. One of the most remarked upon and translated poems in A Poet In New York over the years has been The Dawn. We present it first in its original Spanish as written by Federico García Lorca and with a new Bar None Group translation. that splash about in polluted waters. for the morning offers no hope. penetrate and devour its abandoned children. in mindless games, in fruitless labor. in the shameless pursuit of rootless science. as if they just left a bloody disaster. An interesting perspective of New York indeed...the history you share behind this poem is what intrigues me the most. Poets often have such a way of expressing another side of reality, making us think about things in different ways and enticing us to look at them through different lenses. I quite agree M.J. The circumstances that lead to the creation of a poem are almost as important as the poem itself. In Lorca's case, his disdain of NYC led to a volume of poetry...a volume he had not set out to write.